After first peering into the lower canyon from the rim high above, I had wondered what lay downstream ever since. And I only knew of this canyon because I had camped nearby on another backcountry kayaking trip and… there was this sign. I had first encountered this roadless wilderness 5 years ago after peering over maps of the PNdub looking for something new to explore. Nowadays it’s tougher to find people who want to run things they haven’t heard of, and even fewer yet will actually hike in to get it. I don’t mind the hike. Actually… I kind of like it. No better reward after the punishing hours and miles it takes to get to the put in, than seeing new waters first hand! 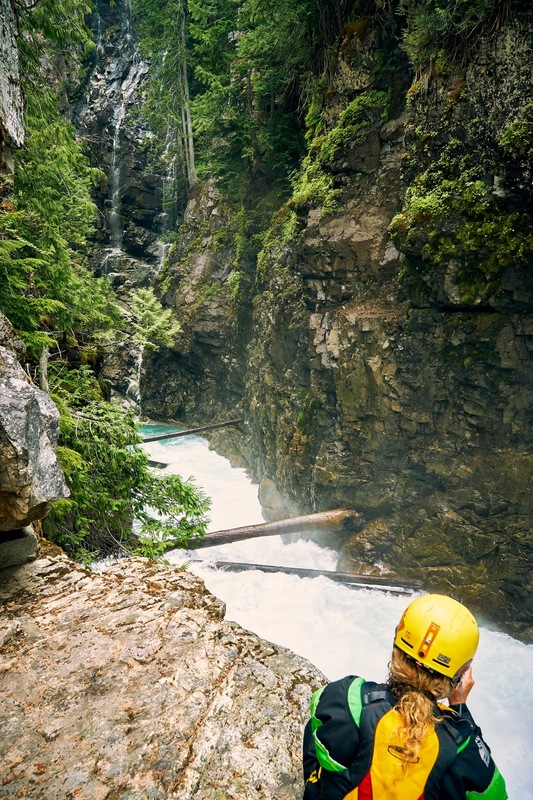 This trip was no exception, and reading trips like THIS only fuels my fire for this type of backcountry paddling experience. 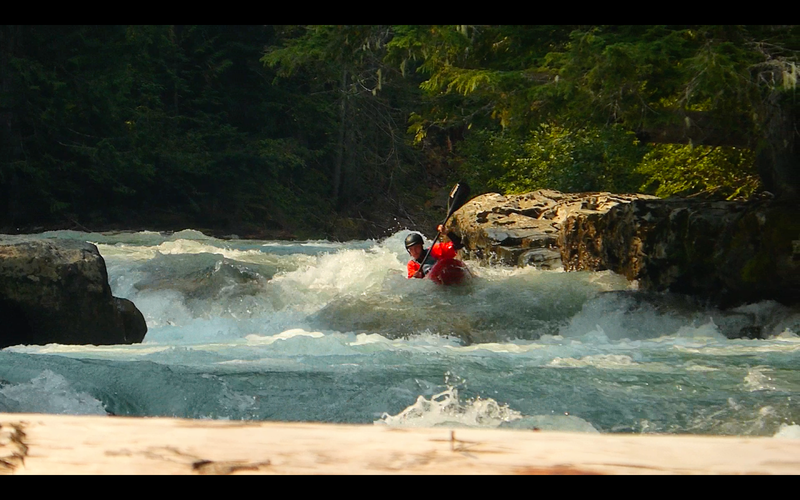 Fortunately for this mission I met Cody Adams a couple days before in Tumwater Canyon. He was out from West Virginia road trippin’. We rolled up for a couple Tum laps that day and started talking about our travels and mutual friends. I showed him a photo, then pulled out a map. I could see by the glint in his eye he was keen to explore the unknown and the only thing left to decide was when. The threat of wildfires was concerning (they were blowing up all around us) as was the unknown water level. Ironically, a friend had been hiking through the area days before and sent me a photo. It did not look low. In fact, it looked prime. It IS the North Cascades after all, and seems to be what’s left late in the summer season here in WA. We did a few more Tumwater laps the following day, went shopping for food, packed that night and rolled out for the ferry early the next morning. PRO Tip: Save yourself some time and leave from Field’s Point rather than the ferry dock in Chelan on this one. It takes the same amount of time to get there from the Wenatchee valley, costs the same, and saves an hour of ferry time on either end of the trip. Starting the trip with a ferry ride up lake was new. Past missions through this zone typically came down Bridge Creek, finishing on the ferry ride out. Smoke was bad the entire ride up from the fires and the next 2 days were supposed to be scorched with winds in the higher-ups. Plenty of nice vista views and by our luck, we met the only kayaker in Stehekin. He looked like a man with a lifetime of stories. “You guys kayaking? Where ya headed? High Bridge? Hop in..” He had a boat sent up lake and was there to pick it up. We dropped it off at his place, and chatted a little on the way up to High Bridge. 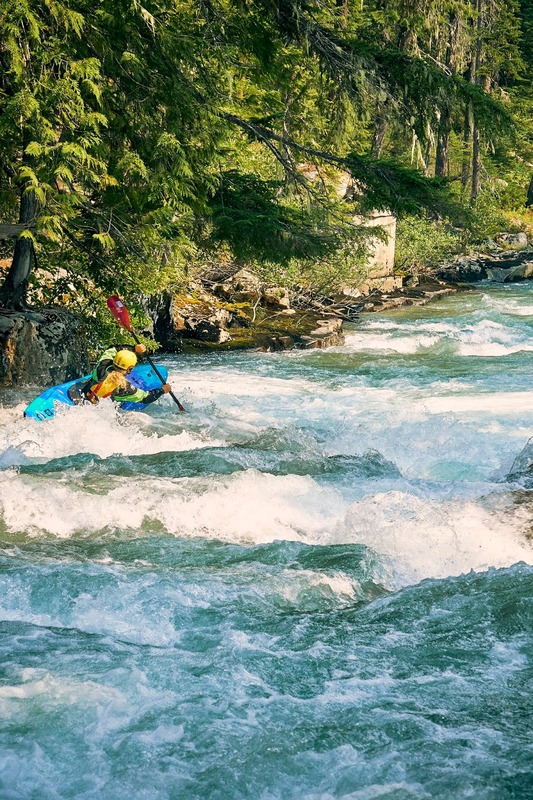 Kayakers are a small group, and the places we congregate are even fewer. Matthew is a character and understands simple living. Got to High Bridge about 1:30 or so and already sweating. It didn’t take long to rig my pack. I was interested in knowing what it feels like to carry a loaded boat for miles and hours in this heat. I’ve done it at night, in the snow, injured, and alone… few things are more meditative or humorous than entering the pain cave voluntarily. Hiking uphill in 100+ heat and smoke with 100 pound boats is pretty much a one-way ticket. This particular pain cave finally broke me. I had to keep moving though, because the deer flies kept biting me open. The up and down, up and down personality of this trail is just as relentless as these angry deer flies. They’re greedy though, and that is usually their undoing. There is more than 500 feet of up on this one, too! No doubt about that. Moving as fast as possible is part of the game in the pain cave, as is staying vigilant with the bugs. How hard and for how long you can keep going is another part. Eventually I’m just stopping too much and getting annihilated, forced to take everything out of my boat so I can move faster, stop less and keep the bugs at bay. Backtracking to grab the rest of my kit as I continue on, plan B isn’t terrible. Sweating the same, but the heart doesn’t feel like a deathpunch through my ribcage. The final tally: 7 hours to go 5.5 miles with a net elevation gain of 500 feet from 1700′ where we started to 2200′ where we camped. Crusher!! At some point during the hike, the deer flies were replaced with mosquitos.. who were… rather aggressive. Rude almost. One landed on my eye. We continued hiking until reaching Five Mile Camp about 9pm. Was nice to set up camp in a breezy little corridor we found. Bug free!! Benedryl, aspirin, and some Annie’s mac n’ cheese was a nice way to quickly settle in before dozing off to the sounds of Agnes smashing downstream, below. I drank nearly a gallon of water on the hike and close to a half gallon before bed. The pain cave is such a comforting meditation and a great way to break out of the mental monotony of ‘the daily’. Highly recommended. 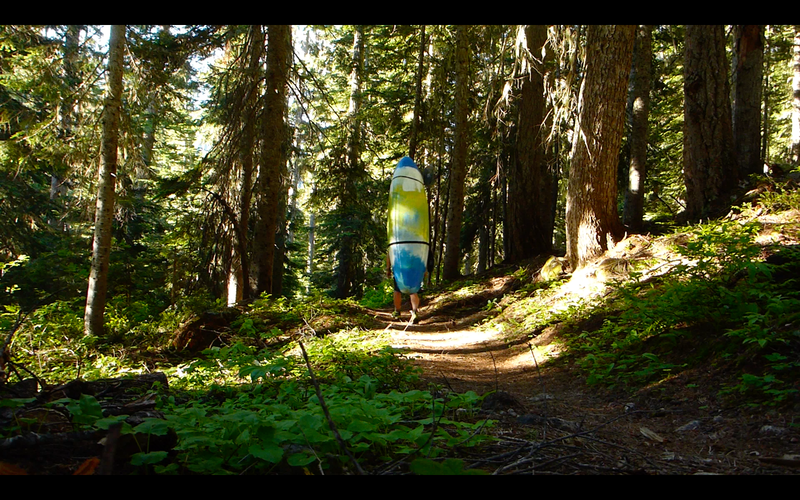 Woke up early to smokey-grey skies and got up for a quick walkabout to find the easiest bushwhack route to the river. The “trail” we were taking from camp, the cut-off trail up the WF Agnes, was almost certainly nonexistent. The aspirin and benedryl helped, good thing I only got stung twice on the hour long shwack to the river. There are paper wasps out here too, and they don’t take kindly to some kayakin’ yay-hoos smashing through the North Cascadian shrubbery. The smoke was drivin’ em down too. More fuel for the pain cave… next time I might try a stroll down Pass Creek instead, it’s right there. Somehow we popped out at the same place I had reached 5 years earlier on a scouting mission. The old bridge footings were still there, as were several modest bedrock offerings. It was 10am, and all too apparent things were about to get sick. Agnes Creek rolled past with some of the most beautiful waters we’d seen in quite a long time… we had quite possibly just arrived at the best place on earth. Most of the road/trail network through the Stehekin valley was developed for mining and logging interests. There had been much activity up the valley in decades past. Was cool to find old relics along the way like the old bridge footings from the swinging bridge pack animals used to transport ore and materials to and from the higher-ups, where it just wasn’t feasible to build roads. 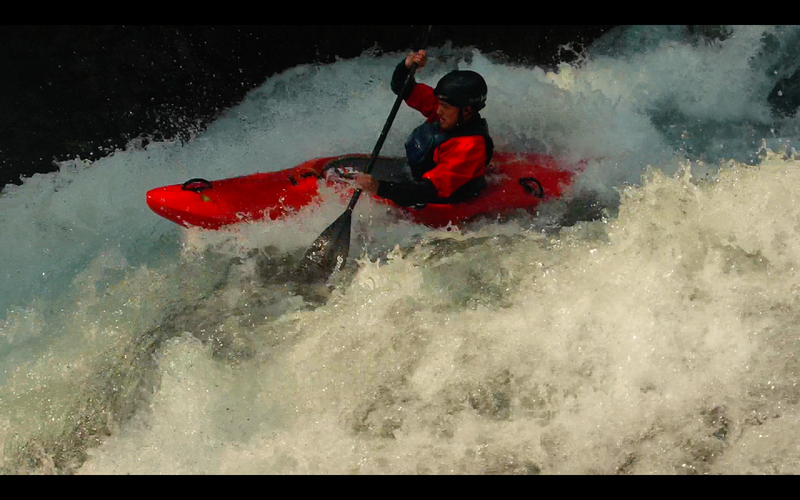 Such a cool feeling to see it again and get to paddle away into the rhythm of uncharted waters this time. The drops started straight away. Agnes does have a continuous nature, but is more pool drop than Bridge Creek, especially in the lower canyon. More of the concentrated goods! Things kicked off early with Fire Hose, a fun chute run on the right. The next sizable ledge dropped 15 feet into a sizable hole with an undercut right wall, known as… Cody’s Cove. Pass Creek confluences river right just above this drop. From here the river took off, opening up a little. Agnes has a narrower streambed than Bridge Creek and tends to hold onto more logs, so keep an eye out. This upper 3ish miles to the main falls is just more of the same quality and variation with no big stand-out drops until you arrive at the lower canyon which begins abruptly and quickly rolls off a marginal 40 with some terrible wood at the bottom making it unrunnable, presently. Eddy left and find the trail on top that will aid in portaging this bit. 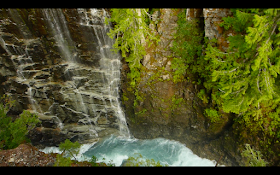 Spectators will note the short box canyon following the main falls. A couple hundred yards down or so the box begins to open up as the river bends left, the trail follows this contour on river left. At this point there is an opening in the woods and you can see this point of reference. 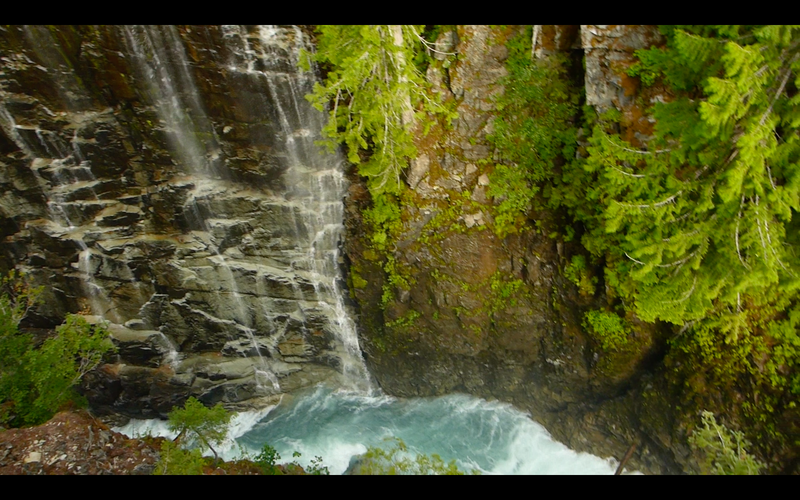 Walk a little further down until you see a gully and follow that treed slope down to the water. Use a rope, they slide easier. Bad wood can become a problem in some years. We had maybe two wood portages on our Aug ’18 trip, but there was plenty along the way. We left a couple drops in there for the next group, too! Agnes holds its water well as much of the drainage is north facing and mountains just a little taller in the north. Spring high water seems to push most everything out to the sides, but pieces always seem to get stuck in funny places, so keep an eye out. One of the final turns in the canyon involves an easy sneak to the right of some major wood stuck in a right bend, with two other logs jutting down into the outside of the corner. You’ll see the swinging bridge from here that you crossed on the way up. A. do it again, you’re right there! Tumwater Canyon’s class 5+ box! 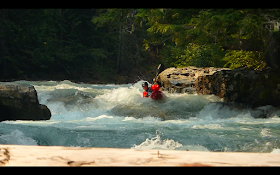 From the put in, bedrock will continue to emerge and create interesting ledges and rapids. Each bend of the river only leads to a growing fascination in what lies further downstream. The water level was a nice medium, nice for scouting as well. We had around 1200 on the gauge with 100+ temps both days. The first canyon was more open with fewer and smaller class IV/V rapids than the lower canyon, the character is similar to the heavier rapids on Bridge Creek proper, just more of them in a tighter gorge. The lower canyon becomes steeper and more continuous with a more ‘locked in’ feel, and rapids bunch up more the further downstream you go. To do this trip . . .
Start with a phone call to Lady of the Lake ferry service (509.682.4584) to book your round trip passage up lake to Stehekin and back, with kayaks of course. It’ll run about $70 per person (and kayak) and can be paid over the phone with a credit card. Use Field’s Point instead of the ferry dock in Chelan for parking/boarding the ferry. Everything, including overnight parking costs the same and it’ll save an hour of travel each way. Check travel conditions/routes on the “Field’s Point” link above and call (509.687.3093) for current pricing on overnight parking ($8 per night per vehicle as of 8/18) and availability. Arrive no later than 9am to get your boats down to the dock, park, and pay for parking in the office there. Once aboard the ferry (hopefully you remembered everything!) it takes about 3 hours to arrive in Stehekin, about 12:30. If you can’t find, or haven’t pre-arranged a ride up to High Bridge you might be in trouble because… there seems to be no guaranteed travel option covering the 10 miles to High Bridge for folks with kayaks. Since we’re new on the scene up there, please do your very best as a steward of your sport to be overly kind and patient with the locals and service-folk who are trying to help and serve You. It’s their busy season and they want to be out in the woods as bad as you do. One option is to try and talk to the Stehekin Valley Shuttle (509.699.2056) to see if they can make an accommodation for your group, hopefully of 3 or less. Those buses are super retro and not big. Pro Tip: Kindness and patience work wonders in Stehekin. Don’t expect a thing and more than likely someone will help you. If you weren’t able to find a ride up and are taking the red shuttle bus, they arrive at Stehekin Landing about 2pm and will have you up to High Bridge by 3pm. Bring some extra $$ for beers at the end of the trip, while waiting for the ferry… and for more interesting things like the bakery. Everything in the bakery is handmade from scratch and about the best thing you’ve ever had. It’s a stop on the shuttle bus going up and down valley, so you can get yum yums on the way out too. Bakery treats are also nice gifts for friends who haven’t made it up to this mountainous refuge yet. Once at High Bridge, the hike begins. Since this is a backcountry experience be sure and bring a map! Hike across the bridge to the left, the Agnes Creek Trail (PCT) will come into view shortly. From here be sure you’re on the right trail and not on the Agnes Gorge trail (which is to the right, uphill). 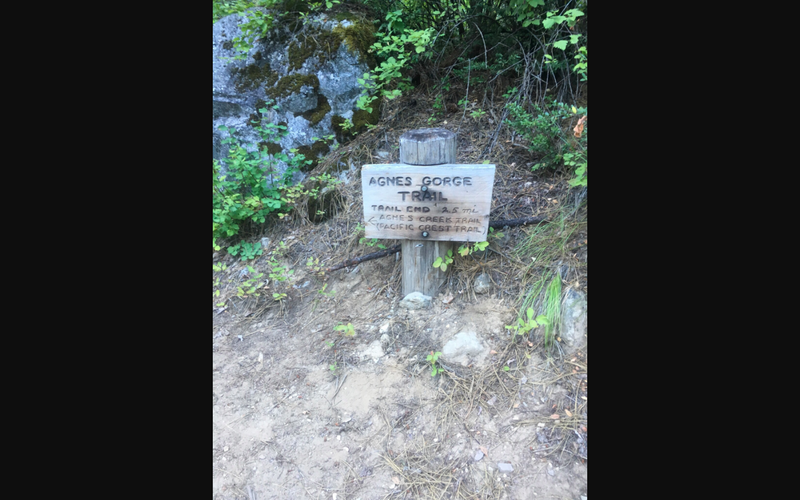 The Pacific Crest Trail (aka Agnes Creek Trail) is the one you want, which heads up the south side (river right) of Agnes Creek. Stay on this for 5.5 miles until you get to the foot log over Pass Creek. Five Mile Camp is just beyond this crossing and where you will start from in the morning. From here we used the WF Agnes trail, from camp, but… there’s no trail. It’s a mediocre, hourish bushwhack to the river’s edge. Next time I’d try heading straight down Pass Creek and see if it isn’t a little faster. It’s right there, and heck, there might even been a cool drop or two on the way! Plan day 1 to ferry up and hike in, day 2 paddle Agnes (took us 4.5 hours to reach the confluence with the Stehekin River, not counting the ‘shwack to the river), and since you’d have to start reeeel early to make the ferry (it’s another 2ish hours of paddling down the Stehekin to the landing), take a 2nd night/3rd day to sleep in, enjoy this zone and get down to the ferry landing by 1pm to make the ferry. If you camped at High Bridge, the shuttle bus leaves there everyday at 12:30 to head back down to the landing. So paddle down or shuttle down, just be at the landing by 1pm to make sure you catch your boat out! Once aboard, enjoy the slower pace and take in the grade A scenery. Lake Chelan is almost unbelievable and absolutely stunning. Stehekin is wild.